This is the second in an occasional series of posts on how to build a robust investment process. Part 1 was addressed to the individual investor and trader (see The ways your trading system could lead you astray). This posts explores the issues that face the professional and institutional investor. I had illustrated in the past why managers closet index. That`s because even a single misstep in an individual position could sink portfolio performance (see How Valeant revealed the dirty little secret of fund management). In this post, I would like to focus on how style and factor exposures affect business risk. I recently came upon a study by Research Associates, which showed the tradeoffs between investment returns and business risk. 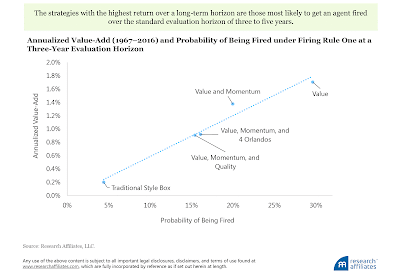 The authors modeled a series of hypothetical portfolios with different styles, namely value, growth, momentum, quality, and random selection, which they called the "4 Orlandos", for the period 1967-2016. As it turns out, the styles that showed the best performance also had the highest chance of getting a manager fired. In the light of these results, the big question for institutional investors is, "We all want good performance, but how far do you want to stick your neck out?" 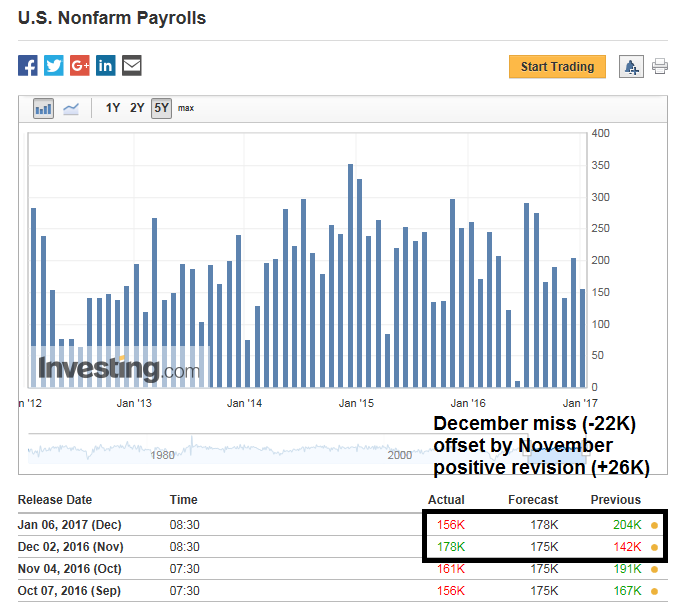 FOMC preview: Hints of a dovish tilt? I had been meaning to write about a preview of the upcoming FOMC meeting. 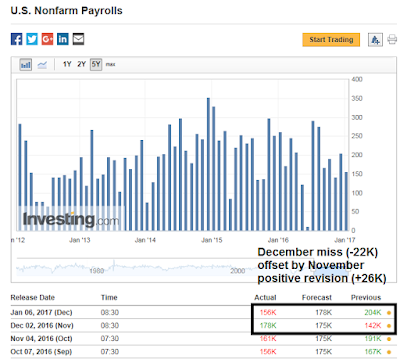 Here are the elements of the Yellen Labor Market Dashboard, courtesy of Bloomberg. As you can see, many of the components have either fully or nearly recovered from the depths of the GFC, with the glaring exception of a subpar labor force participation rate. These factors put pressure on the Fed to start normalizing rates. However, there is one important exception that may cause the Fed to have a slightly more dovish tilt than the market expects. If American conservatives have an intellectual hero, it might well be Friedrich Hayek -- and rightly so. More clearly than anyone else, Hayek elaborated the case against government planning and collectivism, and mounted a vigorous argument for free markets. As it turns out, Hayek simultaneously identified a serious problem with the political creed of President-elect Donald Trump. Like the rules of the road, formal rules do not name names. They are useful to people who are not and cannot be known by the rule-makers -- and they apply in situations that public officials cannot foresee. Forgive me for being cynical, but blah blah blah...None of this matters very much. The main objective of these pages is to make money for my readers. I try very hard to divorce my investment views from my political views. As the chart below shows, the stock market can prosper under both Democratic and Republican presidents. With that preface in mind, here are some key metrics to watch that Donald Trump needs to achieve in order to politically prosper in his first term. In the past few weeks, market analysis in these pages have been all Trump, all the time. As America`s 45th president assumed his first full week in office, his administration made a number of rookie mistakes that gave the impression of a government in disarray. Politico reported that many of presidential executive orders were drafted by Trump aides Stephen Miller and Steve Bannon without consultation with the relevant departments or Congress. These actions made the implementation of some aspects of the executive orders difficult, impractical, or possibly illegal. CNBC reported that the Trump aides were leaking stories as a sign of infighting between different factions. 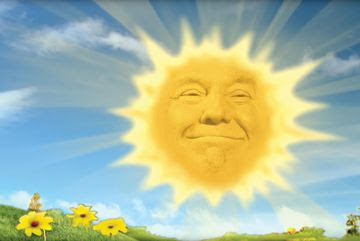 Not only that, the Washington Post reported that most of the senior bureaucrats at the State Department, most of whom had served both Democrat and Republican administrations, had resigned en masse, which deprived the department of years of experience in the nuts-and-bolts of foreign policy. So how did the stock market react to these events? 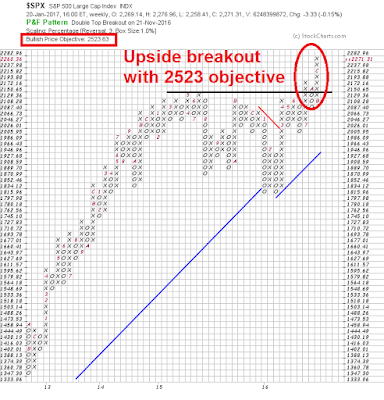 The Dow proceeded to rally above 20,000 to make an all-time high, as did the SPX. This kind of market reaction in the face of negative political news is bullish. 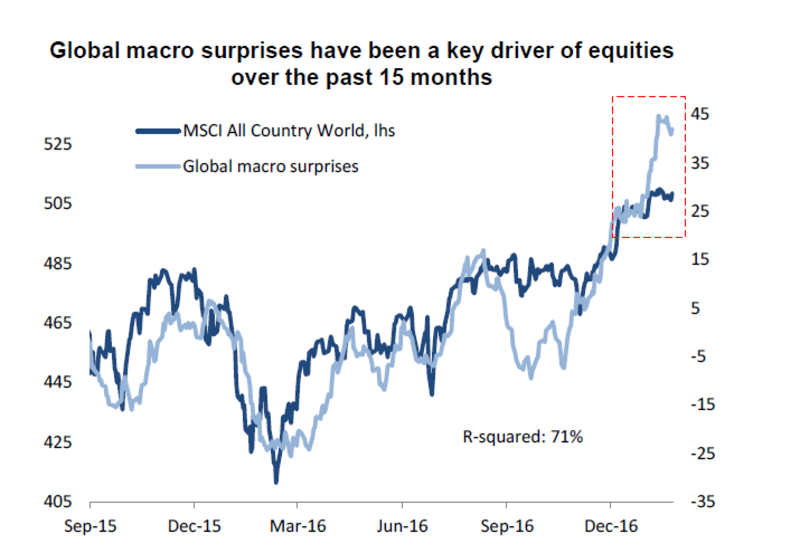 Moreover, it showed that investors and traders had turned their focus to the most important metric of equity performance, namely the growth outlook. 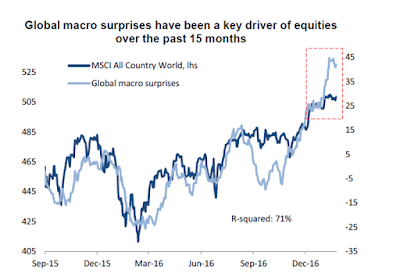 Indeed, analysis from Deutsche Bank showed that macro growth surprises have been the biggest driver of equity prices for the last 15 months (via Bloomberg). I have had a number of discussions with subscribers asking for more "how to" posts (see Teaching my readers how to fish). This will be one of a series of occasional posts on how to build a robust investment process. For traders and investors, one of the challenges is how to build a robust discipline that works well through different market regimes. 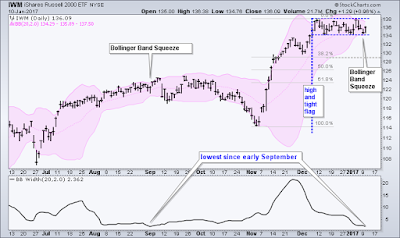 As a case study, consider this study from Simple Stock Model that generates signals based on the cash flows in and out of the SPY ETF as a sentiment signal. The trading rule is: "If the 4-week average of the 3-month change in SPY's percentage of shares outstanding is greater than +5%, be out of the market." The chart below shows the equity curve from this trading system (white line = buy and hold, blue line = trading system). The results look pretty good, especially for a relatively low turnover model. (Incidentally, it's on a sell signal right now). Not so fast! Don't jump to conclusions before digging into the data and reading the fine print. 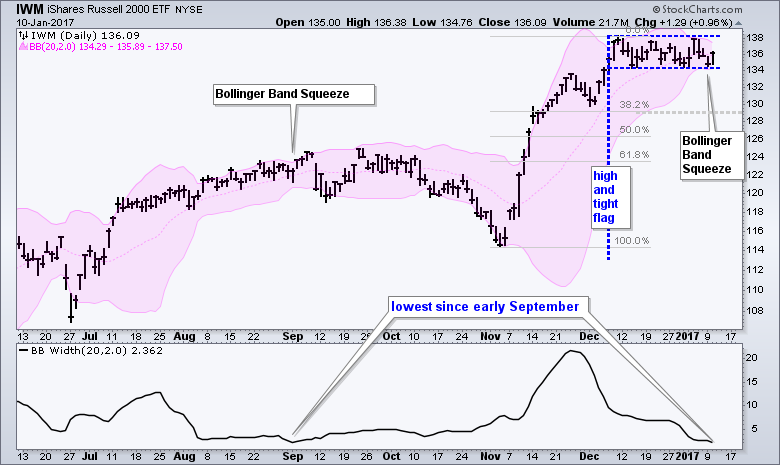 Mid-week market update: Since the time I issued a correction warning in late December (see A correction on the horizon? ), the US equity market has traded sideways in a narrow range. Moreover, the SPX has alternated between a seesaw up-and-down pattern since early January - until today. As the SPX breaks upwards to a new all-time high, and the DJIA breaches the psychologically important 20,000 mark, it's hard to argue with price and momentum. 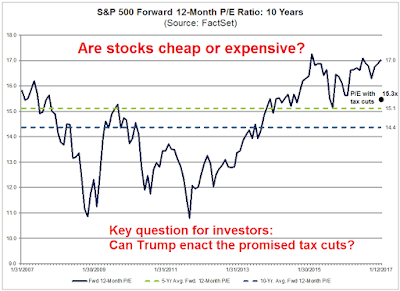 Now that the Trump team has moved into the West Wing of the White House, investors still one big Trump policy question mark that overhang the market. Who will Trump appoint to the two vacant governor seats at the Federal Reserve? CNBC reported that David Nason is a leading contender for a board seat, but he is rumored to be considered for a regulatory role. Such an appointment gives us no hints about the likely future direction of monetary policy and who might replace Janet Yellen, should Trump choose not to re-appoint her as Fed chair in 2018. Potential candidates to head the Federal Reserve in 2018 suggested that monetary policy would be tighter if they were in charge. Speaking at the annual American Economic Association meeting that ended Sunday, Glenn Hubbard of Columbia University, along with Stanford University’s John Taylor and Kevin Warsh, criticized the central bank for trying to do too much to help an economy struggling with problems that monetary policy can’t solve. “The Federal Reserve is a little behind the curve” in raising interest rates, Taylor, a Treasury undersecretary for international affairs under the last Republican president, said Saturday during a panel discussion in Chicago. Hubbard, who headed the Council of Economic Advisers under Bush, said he agreed with what he perceives as Trump’s stance that the U.S. has depended too much on the Fed to support the economy in recent years. Is that what Trump really wants? There is a battle going on for the hearts and minds of the Federal Reserve. 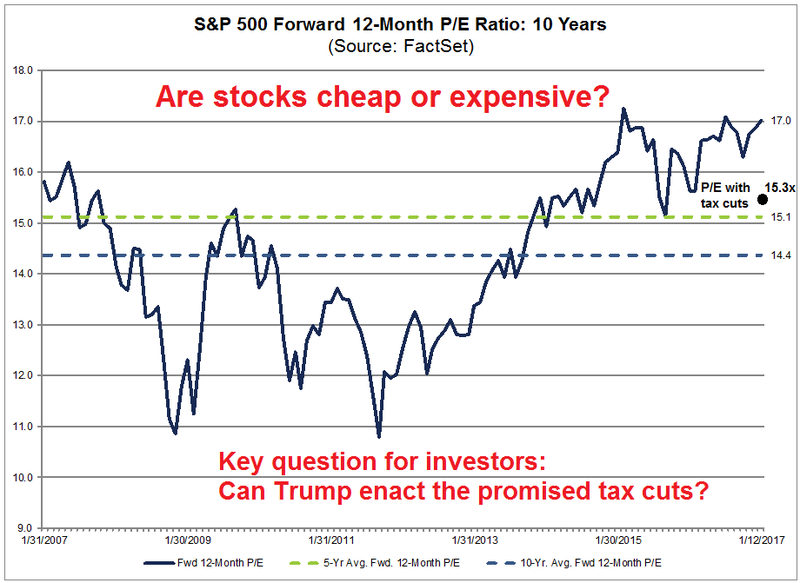 The outcome will have profound implications for the direction of monetary policy, the likely trajectory of economic growth for President Trump's next four years, and the stock market. 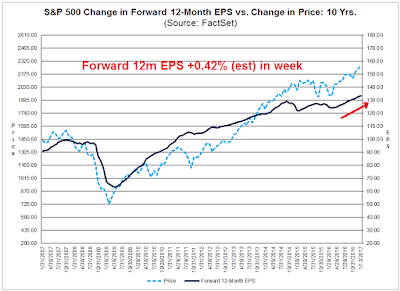 Could "animal spirits" spark a market blow-off? This new administration hates weak, unproductive, socialist people and policies, and it admires strong, can-do, profit makers. It wants to, and probably will, shift the environment from one that makes profit makers villains with limited power to one that makes them heroes with significant power. This particular shift by the Trump administration could have a much bigger impact on the US economy than one would calculate on the basis of changes in tax and spending policies alone because it could ignite animal spirits and attract productive capital. 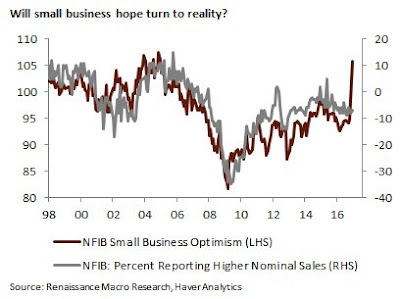 Regarding igniting animal spirits, if this administration can spark a virtuous cycle in which people can make money, the move out of cash (that pays them virtually nothing) to risk-on investments could be huge. America should brace for a final blow-off surge in stock markets akin to the last phase of the dotcom boom or the “Gatsby” years of the Roaring Twenties, followed by a cathartic crash and day of moral judgment, according to a Nobel prize-winning economist. Prof Robert Shiller said the psychological “narrative” behind Donald Trump is powerful and likely to carry Wall Street to giddy heights before the aging business cycle finally rolls over. “I think there will be a Trump boom for a while. 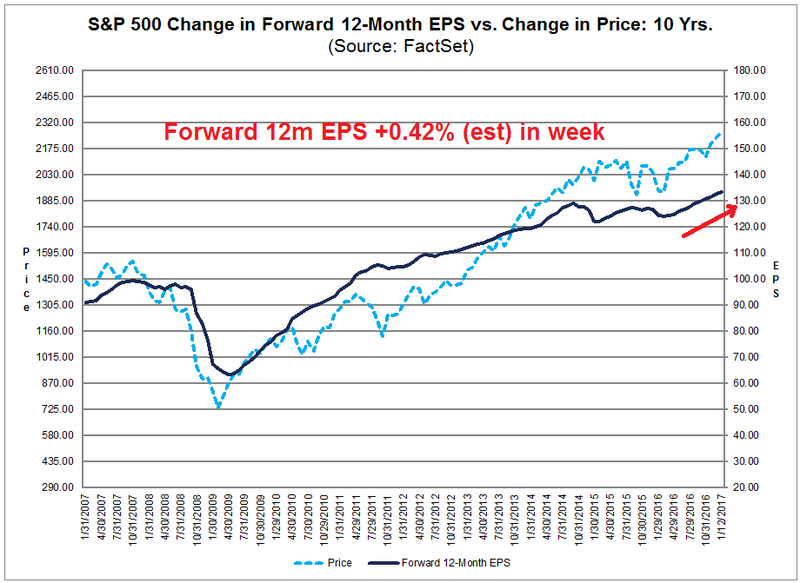 Stocks look high, but they are not yet super-high. In 2000 the (Cape Shiller) price-earnings ratio was over 45 and we may see a repeat of that,” he told The Daily Telegraph. For investors, the stakes are high. 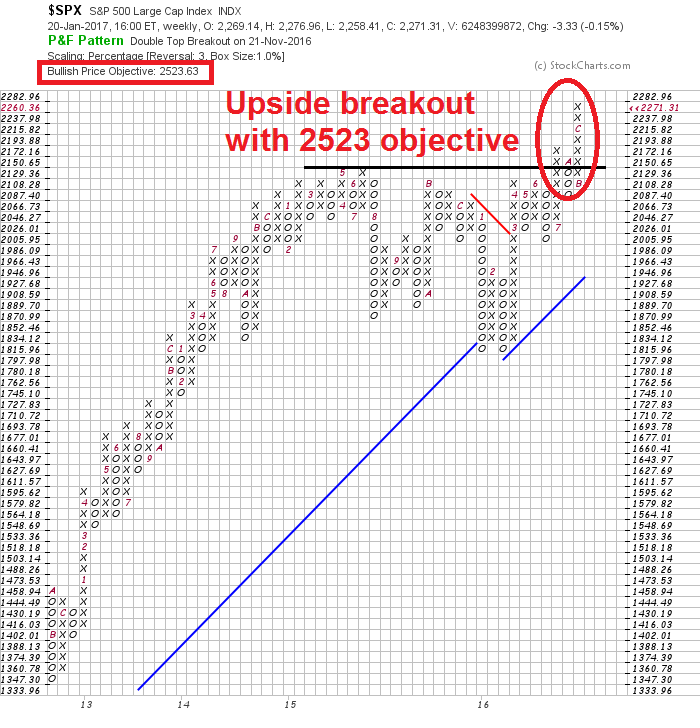 Under this scenario, a Trump inspired "animal spirits" revival could spur the SPX to its point and figure target of 2523 or more. 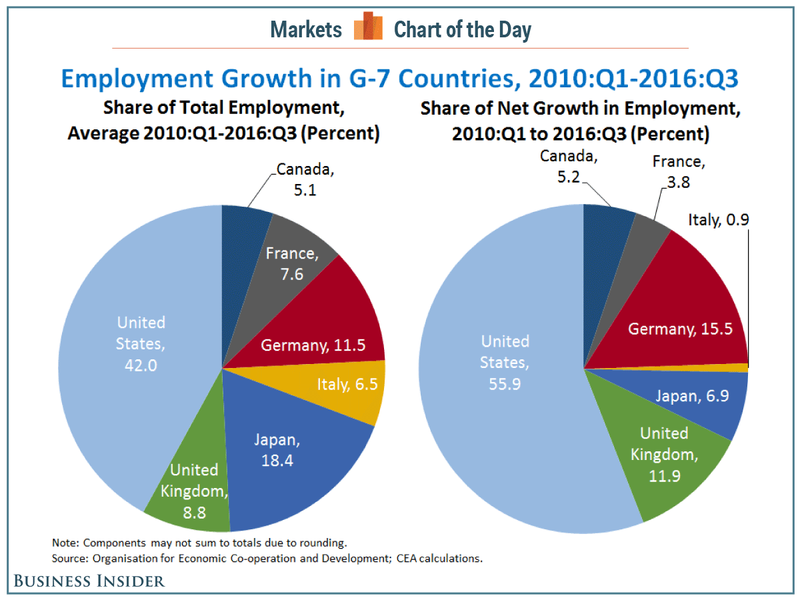 The question is, can Trump spark the "animal spirits" to Make America Great Again? About a month ago (see The bear case: How Trumponomics keeps me awake at night), I highlighted a Bloomberg interview with BAML currency strategist David Woo. Woo pointed that there is an inherent contradiction in a couple of Trump's policies. His fiscal policy of tax cuts is pro-growth and therefore USD bullish, but his "America first" trade policy needs a weaker dollar. So what does he really want, a strong dollar, or a weak dollar? We may have an answer. In a recent WSJ interview, Trump said that the dollar is “too strong”, especially considering the China’s yuan is “dropping like a rock.” While those remarks were made in the context of Sino-American trade relations, Trump signaled that, if he had to choose, he would prioritize a weaker currency over fiscal stimulus. Trump`s priorities of trade policy over fiscal policy is consistent with his criticism of the House Republican border tax adjustment plan as “too complicated“ (via WSJ). Already, the spectacle of passing a fiscal budget, even with Republican control of the White House, the Senate, and the House, is turning into a public “sausage making“ exercise. Summers told a panel at the World Economic Forum on Wednesday that the president-elect's "rhetoric and announced policies" over Mexico have led to a big fall in the value of the Mexican peso against the dollar. That, he said, is a "dagger at Ohio," as it will make it even more attractive for firms to move to Mexico. Mid-week market update: Occasionally, it is useful to step back and view the market through a different prism. I was reviewing the RRG charts of sector, region, and factor, and I found that they are all telling a similar story. First, let's start with a primer. Relative Rotation Graphs, or RRG charts, are a way of depicting the changes in leadership in different groups, such as sectors, countries or regions, or market factors. The charts are organized into four quadrants. The typical group rotation pattern occurs in a clockwise fashion. Leading groups (top right) deteriorate to weakening groups (bottom right), which then rotates to lagging groups (bottom left), which changes to improving groups (top left), and finally completes the cycle by improving to leading groups (top right) again. 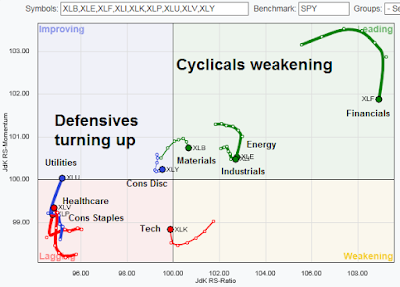 The latest sector rotation chart shows that financial stocks and cyclical stocks (energy, industrials, materials) are the leading groups, but they are weakening. 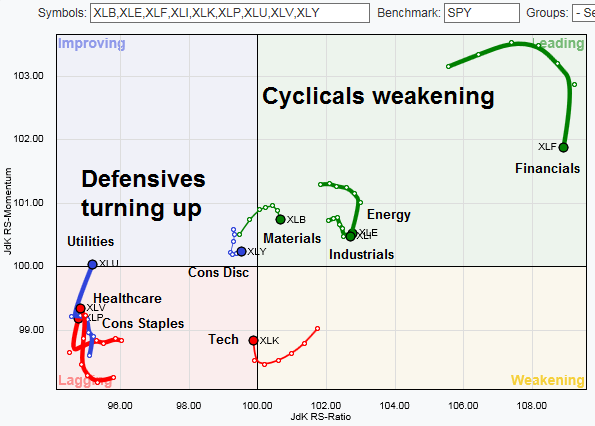 By contrast, defensive sectors are starting to improve from the lagging quadrant to improving. In particular, the upgrade of interest sensitive utilities from lagging to improving quadrant is consistent with the nascent counter-trend rally seen in the bond market.